We have been busy on-site since our last residents’ letter in December, so thought a quick update on what we’ve been up to and how the build is progressing might be useful. We have now completed the demolition phase and the site is really starting to take shape, ready for the next exciting stage of development. Commencing 4 April 2016, we will be assembling the steel frame and you will be able to see the outline of the building coming to life on our live site camera (which can be viewed on our site blog www.harrogatecivichq.com). Engaging with local schools and colleges and getting students involved in the construction of this important building for the town and wider region, is a key part of the project. During National Careers Week in March, we attended events at St Aiden’s High School, promoting careers in construction and updating young people, their teachers and parents about progress on-site. It was great to get out and about in the local community and meet some of those who will directly benefit from and may even work in the new building. As part of our partnership with Harrogate College we have delivered a Health & Safety demonstration to a number of students and will be soon be welcoming bricklaying and joinery students to join our team every Friday, providing an insight into life on-site and the different roles and responsibilities within a busy construction site team. If you are a teacher at or have connections with a local school and would like to learn more about the opportunities for your pupils to get involved, please contact our schools liaison officer Chloe Greenwood on Chloe.Greenwood@harryfairclough.co.uk. We are regularly updating the project blog www.harrogatecivichq.com, where you will find updates on the construction work and can ask questions and leave comments for our site team to respond to. If you would like to speak to our project manager Julian or a member of the Yorkshire management team please contact our Otley office on 01943 851059. Great to be working with Yorkshire-based Comet Steel and to see the steel frame going up on-site. Our team is working hard to install pre-cast concrete floors to each bay/section as we go along. 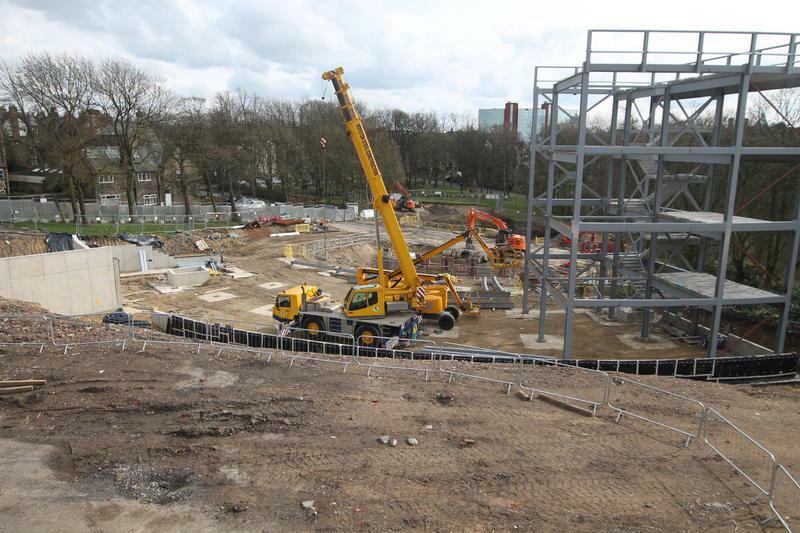 Keep checking our live site cam to see the project progress and the outline of the building take shape!